Sea, Sand & Sky: Treasures at Long Island?! 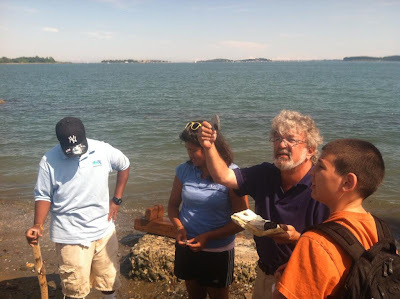 You've heard me talk plenty about the treasures of Spectacle Island and there definitely are many! But surprisingly enough, I found out at Camp Harborview that there were indeed treasures there as well. Bruce surprised Paula, Hugues, Josette, and me with a visit to this wonderful summer camp and took the group scheduled to go fishing to the south beach, named Shell Beach (if anyone was there, you would know why it is called Shell Beach - they were EVERYWHERE!). Truthfully I wasn't expecting to find anything. Little did I know, I was in for a huge surprise. 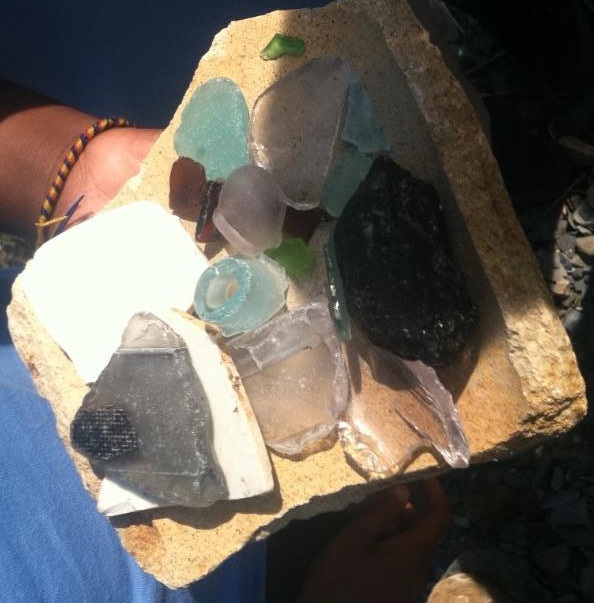 There was a huge part of a bean pot, a GRAY piece of sea glass, parts of rusted old cars, and the remains of mussels, periwinkles, oysters, clams, and limpets were found galore. I learned a lot of things today - the (possible) origin of pink sea glass, the origin of gray sea glass, and a little of the history of Long Island. Long Island used to be a military training facility, which is why there were many rusty car parts half buried in the rocky beach (and Bruce thinks there's a jackpot of red sea glass somewhere!). The pink sea glass could have come from Coke bottles distributed during WWII. America was against Germany, where the US got its specific food coloring for the blue-green glass bottles. So during the war, that certain type of food coloring was no longer available for the Coke producers and therefore they had to use another type which caused the blue-green glass to change into a hue of pink some forty-odd years later. The GRAY piece probably came from a window that was tinted so no one could see inside that certain room. This was the first piece of gray I had ever seen! I hope to find more in my next adventures to Spectacle Island and Camp Harborview! !